Our Manly West family dental practice goes above and beyond to provide our patients with the highest quality of dental care. One example of this is the fact that we create all of our restorative treatment appliances at our very own dental laboratory, located on-site at our sister practice in Mt Gravatt. With the added bonus of having dental technicians in-house, we are able to expertly handcraft precise, custom-made restorations of an exceptional quality. Our registered dental technicians want to achieve the best possible results for your oral health needs, therefore, we only create products using trusted biocompatible materials of the highest quality. 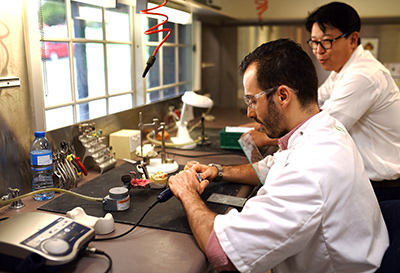 While some patients may be anxious about the cost of complex orthodontic or restorative work, the fact that we have our own in-house lab allows our treatments to be more affordable than others. Additionally, because our models and impressions do not have to be sent to other companies, you’ll find our services are quicker and more efficient, without sacrificing the high quality dental care patients have come to know and love at Q Dental Manly. When it comes to other important elements such as custom shade matching, fit, and design, we eliminate the guesswork other dental practices endure, thanks to our in-house lab. This is also because our lab technicians are able to collaborate directly with our dentists. We pride ourselves on making our dental treatment as accessible as possible to those who need it. This is why we enjoy providing a courtesy car pickup service for older patients – completely free of charge. To be picked-up from their nursing home or place of residence, patients simply need to call our practice to organise the service! You’ll also love that we’re open late and on Saturdays, making our dental services more convenient for full-time workers and those with busy schedules.